-Jesus set me free from panic attacks! 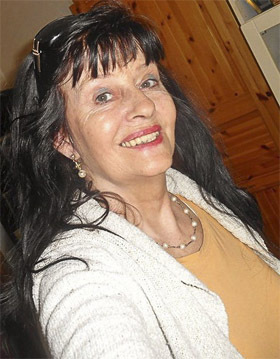 Aina Maria Dons Larsen (62) from Trondheim suffered seven difficult years of panic attacks. She was not saved, but cried out to God every day for help. When she finally let Jesus into her heart, she was cured of anxiety. After several years of stress, financial difficulty and famliar challenges, Aina Maria Dons Larsens life had grown so difficult that her body collapsed. She experienced getting panic attacks, which was leading her into a deep darkness and onto several wrong tracks in the search for the right direction in life. Aina Marie remembers well how it all started. At the time she lived in the town of Skogn. -I had not slept for a long time and I was very tired. I had just dropped the kids off at school that day, and wanted to go for a walk in the woods trying to find some peace. Suddenly fear came over me, and I had to turn around. I was both dizzy, scared and out of breath, and I therefore went down to a payphone where I called the doctor. He understood the seriousness of the situation and prescribed medications. I was so frightened that I was almost unable to walk into the pharmacy to pick up the medines, she says. At home she went to lay down in her bedroom, but the reactions to the medication grew worse. She was scared, tired, and hyperventilating and felt that she lost feeling in the muscles. -I quickly realized that I would be unable to take care of the children when they came home from school and called several friends who came to help me. A friend of Aina Maria worked at a psychiatric ward and helped her get in that same evening. The first night she had to remain in the lockdown unit. What she saw there frightened her so much that the anxiety worsened greatly. I saw people who lived in a world of their own, and I thought that I would become that way as well. The day after I was transferred to the common ward, where I was for a few days, but I went home after a while, because I felt that I did not get any help. Nevertheless, I had to return several times, she said. Aina Marias life was now growing darker every day, and she even wanted to die. -I wanted to end my life, but I often thought about Grandma's words that one has no power over death, because the life we have we have received as a gift from God. I was therefore in the bedroom in the dark and prayed for a miracle. I was not saved, because I had always pushed salvation away from me, but in retrospect one can say that I clung to a rope from heaven. In her desperation for help and joy Aina Maria sought assistance in multiple environments. She got mixed up in both occultism, transmigration, dream interpretation, and various forms of healing, but found no answer. Instead she experienced that God spoke clearly to her that this was not from Him. -I actually got even more anxiety when I realized what I had believed in. Every day was a pain, and I cried every morning when I woke up. I did not have any peace, and was not able to do things in everyday life, because I was also completely burned out. Aina Maria tried to psyche herself up to get out of the house. She felt shame over the nerve problems, and dared not look people in the eye when she talked with them. At times she did not dare go outside, and she would go out the back door and through the yard to fetch the mail. In the fall of 1998 Svein-Magne was going to visit Stjørdal Covenant Church where he was going to pray for the sick. Aina Marie heard about this and thought that maybe she could find help there. Early in the morning she drove south by car. It would be a long and challenging trip. Aina Maria had anxiety, and it also affected her vision. Because of this she never dared to drive faster than 30-40 km / h or to drive on the main roads where large trucks drove. She therefore chose every possible backroad on the way to Stjørdal. -It was both snowing and poor conditions, and I thought that this is not going to turn out well, but with God's help, I arrived there. I sat by the doorway, because there were so many people there, but eventually I regardlessly moved myself into the meeting room. What took place during the meeting was fantastic, says Aina Marie impressed. She is so moved that tears start rolling in the interview with Healing Magazine, although it is now 17 years ago. -I had no plans on getting saved, but when Pedersen gave an invition to salvation, I raised my hand. I had a powerful encounter with Jesus. It was like coming home, and I saw myself walking on a long route to school and then come into a warm and cozy house. As I stood at the front among the saved, I got a vision of Jesus in my heart. It was indescribable and I burst into tears. All my life I had been into various sources, but always passed the cross. Now I had found the truth. When Pedersen prayed for her anxiety, she tumbled to the floor, and she felt that there was something black that disappeared from her body. A light enveloped her, and when she stood up, she could see clearly. -Suddenly I noticed that there were closer to 700 people in the meeting room. I was set free in no time, and received the peace of God in my heart. On the way home I drove in 70 km all the way. I had peace of mind and tears of joy, while I sang "The name of Jesus never fades." In the time after I became so much on fire that I testified to everyone I met. All friends of the occult community turned their backs on me. I did not care, because I had found a living God. I thank Jesus every day that I got my life back. There is nothing that is impossible for Him.